^ The Armenian genocide : history, politics, ethics. Hovannisian, Richard G. New York: St. Martin's Press. 1992. p. xvi. ISBN 0312048475. OCLC 23768090. ^ Dadrian, Vahakn (2004). Winter, Jay, ed. 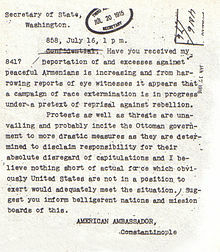 America and the Armenian Genocide of 1915. Cambridge University Press. pp. 52–53. ISBN 1139450182. Libaridian, Gerard (2011). "What was Revolutionary about Armenian Revolutionary Parties in the Ottoman Empire?". In Suny, Ronald; et al. 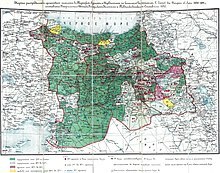 A Question of Genocide: Armenians and Turks at the End of the Ottoman Empire. Oxford: Oxford University Press. pp. 82–112. ISBN 9780195393743. ^ Von Joeden-Forgey, Elisa (2010). "Gender and Genocide". In Donald Bloxham, A. Dirk Moses. The Oxford Handbook of Genocide Studies. Oxford University Press. p. 72. ISBN 978-0-19-923211-6. ^ Kaiser, Hilmar (2010). "18. Genocide at the Twilight of the Ottoman Empire". In Donald Bloxham. The Oxford Handbook of Genocide Studies. A. Dirk Moses. OUP Oxford. p. 35. ISBN 978-0-19-161361-6. Retrieved 15 April 2016. ^ Baghdjian, Kevork K. (2010). A.B. Gureghian, ed. 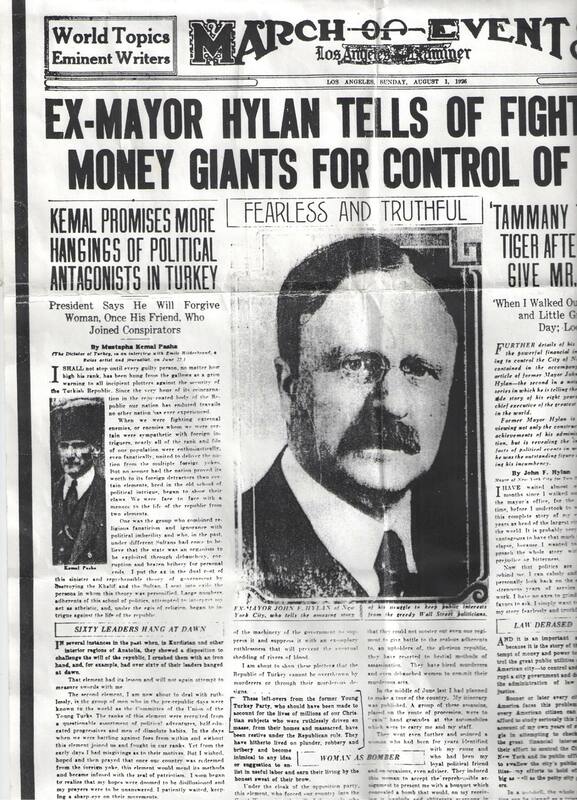 The Confiscation of Armenian properties by the Turkish Government Said to be Abandoned. Printing House of the Armenian Catholicosate of Cilicia. p. 275. ISBN 978-9953-0-1702-0. 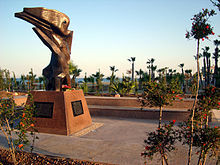 ^ Marashlian, Levon (1999). Richard G. Hovannisian, ed. 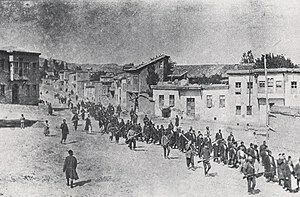 Finishing the Armenian Genocide: Cleansing Turkey of Armenian survivors. Wayne State University Press. p. 118. ISBN 978-0-8143-2777-7. ^ Morgenthau, Henry (2003). Balakian, Peter, ed. Ambassador Morgenthau's story. Detroit, Mich.: Wayne State Univ. Press. p. xxxi. ISBN 0814329799. ^ a b c d Dabag, Mihran (2007). "The Decisive Generation: Self-authorization and delegations in deciding a genocide". In Kinloch, Graham C. Genocide : Approaches, Case Studies, And Responses. New York: Algora Pub. pp. 113–135. ISBN 0875863817. OCLC 437191890. ^ Sarafian (2001). Jacobsen, Maria, ed. Diaries of a Danish missionary : Harpoot, 1907–1919. introd. by Ara. Transl. by Kirsten Vind. Princeton, NJ [u.a. ]: Gomidas Inst. ISBN 1-903656-07-9. Toynbee, Arnold; Bryce, James (1916). Sarafian, Ara, ed. 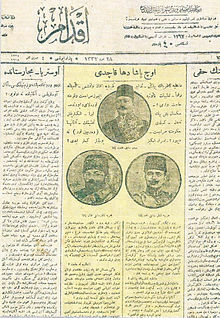 The Treatment of Armenians in the Ottoman Empire, 1915–1916: Documents Presented to Viscount Grey of Falloden, Uncensored ed. Hodder and Stoughton.